She was the youngest ever contestant on The Great British Bake Off and Martha Collison will now be appearing at the Althorp Food and Drink Festival. 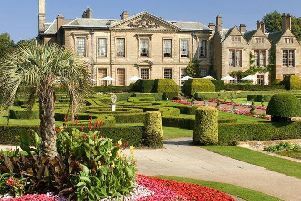 The event at the stately home runs from Saturday and Sunday September 24 and 25. The Rev Richard Coles was a finalist on the most recent series of Celebrity Masterchef and he can also be seen at the event. Dedicated to championing local producers and suppliers of the finest food and drink in the county, the festival promises to be a food extravaganza for all ages with more than 50 exhibitors. There will also be live music, cookery demonstrations, fascinating talks, wine tastings, cookery masterclasses, celebrity chefs, children’s activities, falconry displays, and plenty of sumptuous tastings. Other chefs to be appearing at the event include Aldo Zilli, Richard Bainbridge and Carmella Serano Hayes. The festival runs from 10am to 6pm on Saturday and 10am to 5pm on Sunday. For more details and to book tickets visit www.spencerofalthorp.com.